I had a hard time with this book. I think it was a good idea, but I am not sure that I was happy with how it played out. I feel that this would be a book better suited for a younger audience. The story was very rushed. Suvnin is a very naive and hard-headed kid. He places his friends life in danger in a rebellious attempt to befriend an outsider, Garium. Garium is from the Droom Forest and is quite different than what Suvnin is used to. 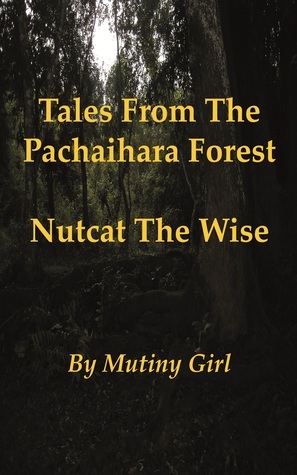 Although Nutcat the Wise has warned Suvnin previously, the boy throws these warnings to the wind and extends his friendship to the young outsider allowing him into Suvnin's home, the Pachiahara Forest. I was a little thrown off when Nutcat the Wise was so adamant about not going out because of a brewing storm, but then agreed to a picnic by the Droom Forest and fell asleep upon arrival. It was just very unrealistic especially since the old bird knew how dangerous the neighboring forest could be. The fact that Suvnin could be so easily swayed by an outsiders pleas was also frustrating to me. He has been warned over and over again about staying away from that place and NOT looking over there. I guess that we all like to venture into things we are warned away from, but still. Once Garium caught his attention and was permitted into the Pachiahara Forest, he made his intent with the bird knowledgeable; he is going to eat him. He escapes back into the Droom Forest with the old bird and forces him onto his enslaved cat cook. He gives the cat, later named Mooshycat, three days to prepare Nutcat. In a twist of fate, Nutcat convinces Mooshycat to side with him and play a joke on this strange civilization. At the huge feast, Garium is put in his place, Nutcat forces new considerations to be accepted, and Mooshycat earns his freedom. Although I felt that the story could of had a stronger plot, It turned out happy. Nutcat turned out to indeed be witty and wise. I felt that it was an ok story, but lacked in many areas. I really appreciate A.R. Sara asking me to review this short story. I wish her the best of luck with future writing. I did receive a free copy for an honest review. Thoroughly enjoyed it. It was a sweet and easy read with a happy ending. I found it both fast paced and exciting, with just the right mix of suspense and drama. Found the interesting turn of events in the story pleasantly surprising. Looking forward to the next book in the series.